Another week of the Alaska Legislative session is in the books, the House has passed the operating budget and we can’t think in anything other than wrestling-related gifs at the moment (Also, if you were wondering, WrestleMania was perfect). As always, take everything with a pinch of salt, use your brain and have a nice weekend. I’ll be up in Fairbanks this weekend, so give me a holler or don’t. It’s a free country. For all the giddy talk this week about Gov. Michael J. Dunleavy’s line item veto power and cheeky waving around of red pens, it’s not striking as much fear in the Legislature as what carefully staged pictures of form letters with visible personal information would suggest. While it certainly grabbed the headlines and filled news conferences, the general feeling around the building is that it’s more talking than walking tall. That’s because delivering the sort of vetoes he would need to pay out a $3,000 PFD (which vetoes alone can’t do anyways because you can’t add money with a veto) is not just unrealistic, not just potentially disastrous for the economy, not just politically untenable, and not just constitutionally suspect, but is realistically difficult because Dunleavy himself has so far proved unwilling to cut that deeply himself. First, despite the cutting rhetoric, the Dunleavy budget team only closed about half of the $1.6 billion “deficit” with undesignated general fund cuts to agency operations. The administration only identified $794 million in cuts with a vast majority of those cuts falling into the realm of what we’d call unrealistic. Of the $242.7 million in UGF cuts to Medicaid, most aren’t actually achievable for all sorts of reasons. The administration even built in a “safety net” that would drain the state’s statutory budget reserve and yield a much smaller $77 million UGF cut. Even Wasilla Republican Sen. Mike Shower recognized these cuts as unrealistic during a hearing this week. The House operating budget has a $58 million UGF cut to Medicaid. The governor can veto Medicaid all he wants. But because so much of the program is funded by formulas and driven by the feds, it’ll mean he’ll have to come back to the Legislature with a supplemental budget—or, you know, just stiff medical providers on their bills. Too large of a veto could jeopardize federal funds for the program and would invite a host of lawsuits that will rightfully claim the cuts violate Medicaid eligibility statutes. Then there’s education funding. Dunleavy has proposed cutting K-12 education and assorted other programs by $325 million this year. The problem—as we’ve seen play out over the last few days—is the Legislature has already signed off on this and the upcoming K-12 budget is already in law, out of reach of the veto. The read on the sudden concern about the constitutionality of the forward funding is that it’s all a show to make the money available for veto. You can call it a “debate,” but it’s like debating whether or not windmills cause cancer. Those complaints about the constitutionality, of course, run into a little problem, namely that the administration itself proposed repealing the measure. Between those two, about 58 percent of his proposed cuts—or $467 million—were never really on the table in the first place. The rest of Dunleavy’s budget was balanced by taking money out of local government hands by seizing the property taxes they levy on oil and gas properties and taking fisheries tax revenue. Both require legislation that neither the Senate nor the House have been interested in even considering. 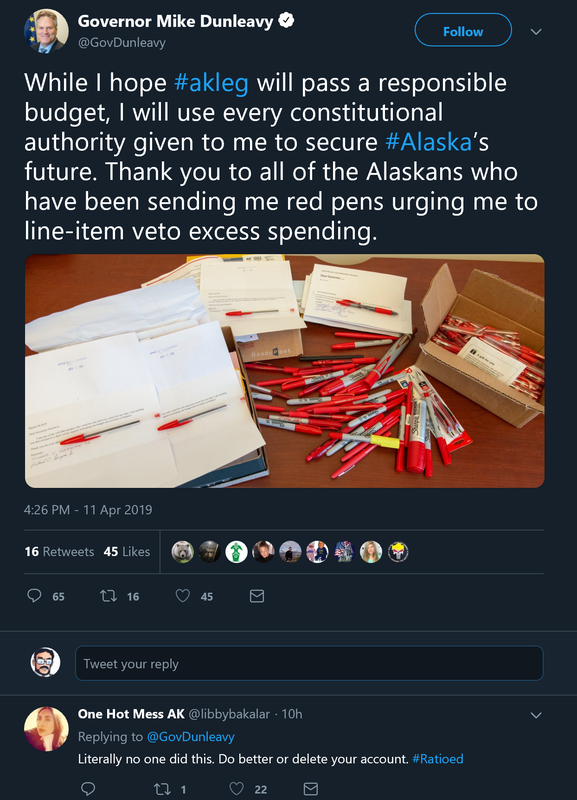 Still, none of this is to dismiss the parts of the budget where the line item veto can easily fall: The University of Alaska and the ferry system come to mind. The governor could zero out funding for both would still fall far short of the proposed cuts, so it still makes the actual work of building a coalition to override the veto critical. On the front of “Oh, no, we actually have to figure out how to deliver on the rhetoric,” the governor today introduced legislation that would repeal and dispose of the Power Cost Equalization fund, civil legal services fund, curriculum improvement fund (We thought this was the education governor! ), higher education investment fund and the community assistance fund. The House responded with the rare five committees of referral, brutal treatment that not even Rep. David Eastman has seen with his legislation (the max he’s seen is four committee referrals). But, really, why stop there? It certainly could use a stop to the Special Committee on Tribal Affairs and the Labor and Commerce Committee. Turns out the Department of Health and Social Services ran out of money for senior benefits so 4,731 Alaskans will be going without their monthly benefits in May and June. Most administrations would see this sort of thing coming and would have asked for additional funds in a supplemental budget, but not this one. From what we’ve heard, the senior benefits program isn’t the only place in the Dunleavy administration that’s running out of money faster than expected. Except in the other cases, there’s no seniors to blame. We’re hearing complaints from career public servants who are running into loads of frustration with, well, in their words “the incompetence” of the administrations’ political appointees. Their complete lack of government experience isn’t really being made up with their alleged good ol’ private sector acumen, either. Some of them are just now, five months in, bothering to look at the budgets they oversee, we’ve heard, which comes in pretty stark contrast to the interest they had in their personal expense accounts on day one on the job. That’s how much gray water—water from sinks, baths, showers, laundry and kitchens—that Holland America dumped into the water at Glacier Bay National Park in Alaska last September. This comes as the governor—and now the Legislature for that matter—are intent on defunding the 24/7 pollution monitoring Ocean Ranger program. But, hey, maybe we could just reclassify cruise liner pollution as a non-issue, like with what the Department of Environmental Conservation quietly did with PFAS pollution in groundwater near airports, as columnist Dermot Cole uncovered this week. The governor is so busy with all these red pens that we heard a request to proclaim this week the Week of the Young Child. Though the records of proclamations made under previous governors aren’t easy to quickly look up, we’re told that this is the first time ever such a proclamation has been denied. The House State Affairs Committee finally got to hear from Department of Public Safety Commissioner-designee Amanda Price’s former bosses on Thursday. While some were still enamored with the smooth talker, former Chief of Staff Scott Kendall was far less charitable in his assessment of her work history. In addition to saying he had also heard about the allegations of plagiarism, he also said she had a hard time showing up for work. “Personally, I witnessed the chronic absenteeism every day. As I say I was in that office or on teleconference meetings from Juneau every day. I never had a day off. I worked all weekends and I literally physically saw her three times. Once I passed her in the hall and the other two times were scheduled meetings with me,” he said. The Associated Press covered the hearing in detail, but much of what Kendall said aligns with rumors that we’ve heard about and what the Alaska Landmine has published. Those were apparently House Speaker Bryce Edgmon’s words to Rep. David Eastman during the wrap-up on the operating budget. Apparently forcing everyone to listen through his many cut-less intent language amendments wasn’t enough attention. 2 Comments on "Friday in the Sun (April 12): The Red Pen edition"
You know, I do legitimately wonder if Eastman has any close personal relationships besides with his wife or family. Does he have the emotional intelligence to build a friendship with somebody? Wait, I bet we can all guess the answer to that . . . Note to the guy who owes me $20 and who has been brandishing a red pen. Your transparent PR ploy is laughable. You’ll not be getting a red pen from me, rather, a small baggie of moose nuggets that has more substance than the budgetary plan(?) you propose.